Ever since Gus Johnson announced San Jose Earthquakes games on radio last year, the question has been in place. Would Fox dare take their top college football play by play man and transform him into the voice of their World Cup coverage in 2018? We finally know the answer. A resounding yes. "The 45-year-old broadcaster will call his first match for Fox Soccer on Feb. 13 (2 p.m. ET) from Madrid’s Estadio Santiago Bernabéu when Real Madrid faces Manchester United in a mouthwatering Champions League Round of 16 match. The assignment is the first in a series of high-profile soccer matches for Johnson, including a second Champions League match between Arsenal and Bayern Munich in London on Feb. 19 and a Premier League game between Manchester City and Chelsea at Etihad Stadium on Feb. 24. Johnson will call additional Premier League and Champions League matches and is scheduled to call the FA Cup final on Fox on May 11 and the Champions League final (also on Fox) on May 25. Johnson will be on site for each of the games. Both Shanks and Johnson emphasized repeatedly in interviews this week with SI.com that Johnson as a soccer announcer is a long-term work in progress. If all goes well, Johnson will be Fox’s lead announcer for the 2015 Women’s World Cup as well as its lead voice for the 2018 World Cup. Asked where he was in his soccer education, Johnson used the word “novice.” Why novice? “Because it’s a lot of information,” Johnson said Monday at a patisserie near his home in New York City." There are several layers to this move to install Gus Johnson as Fox's lead soccer voice, almost too many to encapsulate in one post this soon after the news has dropped. It will have an impact not just on Johnson and Fox, but on the American soccer community where the desire for an "American soccer voice" has been strong. The risk: Fox stunned everyone when they took the World Cup rights away from ESPN for 2018 and 2022. ESPN had won plaudits in 2010 for their outstanding World Cup coverage, mostly because of the professional display from the booth. ESPN outsourced their top announcing spots and brought in veteran British announcers Martin Tyler and Ian Darke, considered the gold standard in the English speaking world. Darke became such a hit calling USMNT games that ESPN signed him permanently after the World Cup to be their top soccer announcer for both USMNT and EPL coverage. This was a long cry from 2006 where ESPN inexplicably put Dave O'Brien in the top slot and dumbed down the coverage to prehistoric levels. The result of using a novice was disastrous. O'Brien and partner Marcelo Balboa were panned and O'Brien even called soccer fans a "petulant little clique" due to the criticism. Johnson himself admits he is a novice. But, he and Fox are committed to growing as a soccer announcer over the next five years. Furthermore, Johnson is a fan of the game and has immersed himself in soccer over the last year. One doesn't call MLS games on radio just for fun. But will he be ready February 13th for Man Utd vs Real Madrid? Will he be ready for this year's Champions League Final on Fox network television? Will Johnson and Fox be willing to endure the criticism that comes with the growing pains both will face from a fan base who has shown little patience for similar moves in the past? These are huge tests and Johnson better hit the ground running from the outset, or else Gus at World Cup 2018 could be nothing more than a brief fantasy. The potential: When we talked to Rob Stone before last year's Champions League Final, he talked about the need for soccer coverage in America to have a distinctly American voice. Since O'Brien's folly in 2006, the major networks have used British announcers for the biggest events. As soccer has grown in America over the last five years, it's been with a distincly British accent. Many will argue that to take the next step, American soccer fans should have American soccer announcers and not have to depend on the Tylers and Darkes and Healeys of the world. I don't necessarily subscribe to that theory – I want to hear the best whether they be from New York, London, Sydney, or Cape Town. 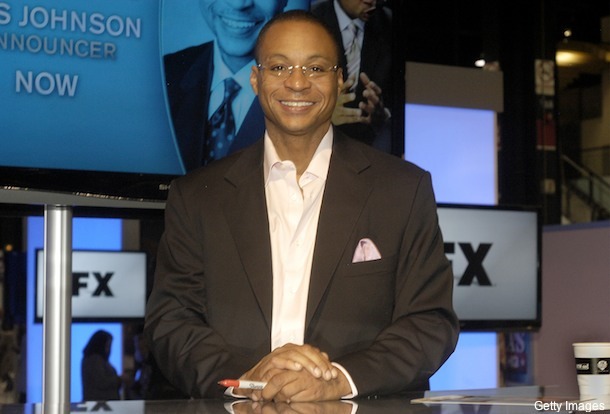 But if Fox has made the commitment to use an American voice for the 2018 World Cup, who better than Gus Johnson? If Gus could take the same excitement and attributes from college sports that have made him a hit with a younger generation and successfully transfer them to soccer, this will be an absolute home run with American soccer fans. For Fox: Although filled with risk on the surface, it seems Fox is taking the correct steps to make this a move that will attempt to further bring the beautiful game to the masses in this country, yet also respect knowledgable soccer fans along the way. They were never going to follow the ESPN blueprint with their World Cup coverage. And perhaps, that was to their detriment in the early stages of their network soccer coverage. Remember football vs. futbol? Remember Piers Morgan? Although they've made improvements, Fox is still struggling to catch up to the polish and poise that ESPN has displayed with their soccer coverage. Meanwhile, since Gus Johnson moved to Fox, we've wondered why the network wasn't getting more out of their prized free agent acquisition. Yes, he's their lead voice for college football, but the sport is down the totem pole at Fox and significant games are sporadic. Johnson has rarely been seen elsewhere on the network with an NFL game here and there and not much else aside from his work on Big Ten Network. Gus Johnson will now be announcing the biggest soccer games in the world for Fox beginning this year. For fans of his asking for more, your prayers have been answered… just not in the way you may have expected. For soccer fans asking for more of Fox's coverage of soccer, the proof will be in the pudding. For Johnson: Make no mistake, Gus Johnson is taking a huge leap of faith. One of the most well known announcers in sports learning an entirely new craft is a step few would ever even dream of considering. Imagine Joe Buck stepping in to call the Daytona 500 or Jim Nantz calling UFC. Johnson could easily stay where he is at Fox, maintain his cult following, and be content with life. But Gus is 45 and he's never been able to break the glass ceiling of the Nantzs and Bucks of the world. The World Cup represents Johnson's opportunity to finally move beyond that box of "Rise and Fire" and to the top of the industry. Given the substantial risk involved and the needed commitment over the next five years, if we look back in 2018 and see this as a success for Gus Johnson it will stand as one of the most respected accomplishments in the broadcasting industry. Johnson becoming the voice of soccer in America could have an impact far beyond the broadcast booth as well. Summary: This move is quintessential Fox. A bold, industry-transforming decision that has little room for middle ground. Either it'll be an incredible success story or we'll be talking about Fox trying to mold Gus Johnson into a soccer announcer the same way we talk about the glow puck. As a fan of soccer and a fan of Johnson, I hope all the work put in over the next five years pays off and it falls into the former category. One thing's for sure, Fox Sports marches to their own beat. But, in their trademark fashion, Fox was always going to put their own unique mark on the world's biggest sporting event, and this news certainly qualifies. Fox's journey to the World Cup and Johnson's journey to become the voice of American soccer begins next week in Madrid. We'll all be watching.